Analyzing the impact of currencies volatility across industry verticals. Over the past couple of years, CFOs, treasury, accounting and finance departments around the world had to adapt to a seemingly long-term resurgence in currency volatility. Following a period of relative calm, a number of global macroeconomic factors converged in a perfect storm to create a climate of uncertainty. How can CFOs, accounting, finance and corporate treasury departments navigate the volatile times that loom ahead? The particulars will vary from sector to sector, business to business, but few overarching principles apply across the board. 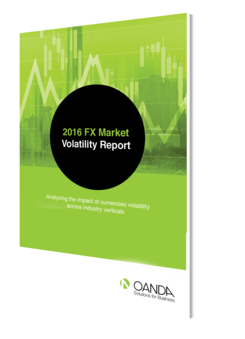 Download our free report today to learn how each industry can manage FX exposure. © OANDA Corporation. All rights reserved. "OANDA", "fxTrade" and OANDA's "fx" family of trademarks are owned by OANDA Corporation. All other trademarks appearing on this Website are the property of their respective owners. As if connected by string, FX and commodities are dependent upon, and often victim to, each other's movements. Multinationals of all types are feeling the pressures of this year’s volatility in global FX markets. None more so than manufacturers, whose sprawling supply and distribution networks expose them to exchange rate risk at all steps of the production process. Low currency prices are boosting growth figures for firms focused heavily on exporting, while high currency prices are having the opposite effect for their not-so-lucky competitors domiciled in countries such as the US. Travel companies tend to have a lot of cash and liquid assets on their balance sheets (coming from a variety of currencies) — making them particularly sensitive to sudden fluctuations in the FX market. Whether you are a large tech company based in the US or an up-and-coming startup located in Singapore, it is clear now that currency volatility is here to stay and might affect you more than you think.